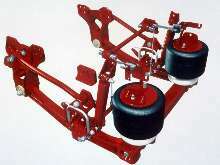 Suspension System supports firefighting vehicles. FIREMAAX(TM) rear air suspension system automatically adjusts to variations in load and road conditions. Available in single-axle and tandem configurations, system offers capacities of 24,000 and 48,000 lb, respectively, for fire and rescue vehicles. Parallelogram design controls suspension windup and frame rise. FIREMAAX includes heavy-duty forged support beams and outboard-mounted torque rods for roll stability. WOODRIDGE, Ill. - With the launch of FIREMAAX(TM) rear air suspension system, Hendrickson brings fire and rescue vehicles the superb ride, stability and handling proven in the heavy-duty trucking industry. FIREMAAX, derived from Hendrickson's acclaimed PRIMAAX® air-ride suspension system, automatically adjusts to variations in load and road conditions for optimal ride, performance and durability. Combining a robust design with performance enhancing features, FIREMAAX delivers numerous benefits to firefighting vehicles previously unavailable in air suspensions - highlighted by an outstanding ride for superior driver and passenger comfort and helping to protect critical equipment and electronics from excessive vibration. FIREMAAX comes in single-axle and tandem configurations with capacities of 24,000 and 48,000 pounds respectively for fire and rescue vehicles. It uses a unique parallelogram design that significantly controls suspension windup and frame rise. The suspension geometry of FIREMAAX produces enhanced stability. Heavy-duty forged support beams, outboard mounted premium torque rods and a highly-engineered cross brace (patent pending) combine to attain up to twice the amount of roll stiffness as other air ride suspensions. This greater roll stability particularly benefits high center-of-gravity applications. The suspension geometry also reduces roll-steer providing the driver greater control during lane changes, highway ramp operation and tight road maneuvers. Hendrickson field tested PRIMAAX, the vocational truck version of FIREMAAX, in applications with peak engine torques as high as 2,200 ft-lbs., and results showed elimination or significant reduction of frame rise during peak driveline torque often found in trailing arm air suspensions. The reduction of frame rise combined with suspension geometry helps control pinion angles throughout axle travel. "PRIMAAX has been field tested in a variety of vocational and heavy-haul applications with drivers reporting exceptional ride and handling improvements in comparison to other air suspensions available today," reports Gerry Remus, vocational marketing manager for Hendrickson Truck Suspension Systems. "FIREMAAX represents an opportunity to bring these same performance benefits to our fire and rescue customers." FIREMAAX delivers numerous maintenance features including air springs and premium shock absorbers packaged within the envelope of the tire for additional clearance and the unique QUIK-ALIGN® system to simplify axle alignment without welding or drop-in shims. Hendrickson premium torque rods employ bonded rubber bushings for longer service life and elimination of lubrication requirement, while the outboard mounted longitudinal rods improve serviceability. For more information on FIREMAAX, contact Hendrickson Truck Suspension Systems, Woodridge, Ill., at 630-910-2800. Hendrickson International is one of the largest global suppliers of truck and tractor suspensions; trailer suspensions; lift, trailer and steer axles; springs, and bumpers to the commercial transportation industry. Headquartered in Woodridge, 111., Hendrickson has been meeting the needs of the transportation industry for 90 years. Visit the Hendrickson website at www.hendrickson-intl.com. Suspension Kit converts walking beam to air ride. Trailer Suspension System suits self-steer axle applications. Rear Air Suspension suits Class 8 trucks. Axle Control raises and lowers self-steering trailer axles.